дома » ARMENIAN - ENGLISH CONVERSATION GUIDE հայերեն անգլերեն զրուցարան » ՀԱՅԵՐԵՆ — ԱՆԳԼԵՐԵՆ ԶՐՈՒՑԱՐԱՆ: ԵՐԿՐՈՐԴ ՄԱՍ: 6. ԽԱՆՈՒԹՆԵՐ, ԳՆՈՒՄՆԵՐ. SHOPS. ԳՐԱԽԱՆՈՒԹ. BOOKSHOP. 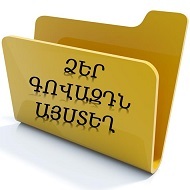 Ներբեռնել լավ որակով ( PDF) 6. ԽԱՆՈՒԹՆԵՐ, ԳՆՈՒՄՆԵՐ. SHOPS. շոփս. ԳՐԱԽԱՆՈՒԹ. BOOKSHOP. բուքշոփ:( էջ 100-101). Այս վեպը հեշտ է կարդացվում: Do you enjoy reading books? Ես կուզենայի հանրագիտարան գնել: I’ve read this book in the original. թարգմանիչը Who is your favourite writer? Previous post: ՀԱՅԵՐԵՆ — ԱՆԳԼԵՐԵՆ ԶՐՈՒՑԱՐԱՆ: ԵՐԿՐՈՐԴ ՄԱՍ: 6. ԽԱՆՈՒԹՆԵՐ, ԳՆՈՒՄՆԵՐ. SHOPS. ԿՈՇԿԵՂԵՆ. FOOTWEAR. Next post: ՀԱՅԵՐԵՆ — ԱՆԳԼԵՐԵՆ ԶՐՈՒՑԱՐԱՆ: ԵՐԿՐՈՐԴ ՄԱՍ: 6. ԽԱՆՈՒԹՆԵՐ, ԳՆՈՒՄՆԵՐ. SHOPS. ԿՏՈՐԵՂԵՆ. DRAPER’S.